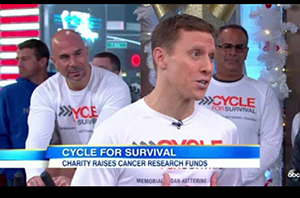 FKB’s Mike Furman appears on Good Morning America in support of Cycle for Survival, a fundraiser for cancer research at Memorial Sloan Kettering Cancer Center. Cycle for Survival is an indoor team cycling fundraising event (like a huge “spin” class). 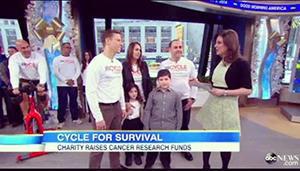 Attached are some photos and a video clip (http://abcnews.go.com/GMA/video/cycle-survival-raises-money-cancer-research-21410128) from the appearance on Good Morning America on January 3, 2014. To donate – Click here to donate to Cycle for Survival. 100% of the donations to Cycle for Survival go directly to fund rare cancer research at Memorial Sloan Kettering. Please join FKB in the fight against cancer- this is a wonderful cause to fight for. So many of us have loved ones, friends and colleagues that have battled various various cancers. It is so important to fund research and find new ways to fight cancer.